My Seminole Piecing online workshop begins on June 26th at the Academy of Quilting. 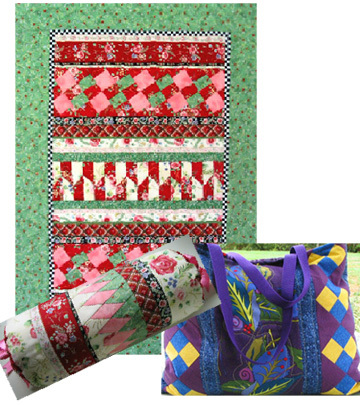 If you have ever wondered how to make these intricate bands of patchwork and the interesting projects you can make with them, join me for lots of fun and education. You'll learn how to make 8 Seminole bands in class and how to turn some of them into a totebag, a bolster pillow and a wall quilt. Seminole Piecing is a patchwork method used by the Seminole people of south Florida to enhance their garments. I will show you how to create the bands of patchwork using simple rotary cutting and basic piecing techniques. The magic comes when you cut the units apart and sew them back together. You will also be inspired by my suggestions to use the bands to trim garments and home décor items. The workshop is 3 lessons, with one lesson posted each week. The classroom will remain open until August 3rd so even if you can't begin right away you can still enroll for the workshop. I will be there to answer your questions and share my knowledge every day. You can share pictures with the class as we go along. I love seeing your work! The tuition is only $30 US and you can learn from the comfort of home - with your entire stash of fabric to work with and all your favourite tools and equipment. Don't you just hate it when you travel to a class and you know you have the perfect fabric, but it's at home in your fabric stash! It's no problem when you take my online class. You can even sew in your PJs – I won't tell! If you can sew with a 1/4" seam allowance, this class is for you! I hope you will consider joining me. See the supply list, read more details about what is covered in each lesson and sign up today.